"We believe so strongly in the quality of what we make that if, at anytime, our product fails to meet your needs, we are happy to exchange or return it. Because of this solid belief, our products are guaranteed forever and are designed with this in mind. Your total satisfaction in our product is our goal. " The Outdoor Research W's Luna Jacket is one good-looking jacket! The fit is trim without being fitted and doesn't shout out "Technical". The pomegranate color is a deep rich stylish color that will coordinate nicely with my casual about-town clothing. I rarely worry about being fashionable while hiking though the color won't really clash with my hiking gear either. The first thing I noticed about the Luna is that it isn't "loud" like some of my other waterproof wearing apparel. While there is a bit of a noise when I move about, it's more of a "whishing" sound than a "crackling". I think that is a result of the 100 % polyester exterior of the Paclite fabric shell which feels very smooth and almost soft to the touch. The interior of the shell is a dark gray typical Gore-Tex coated self-backing. All seams are fully taped and sealed. The usual tags for fabric content, Gore-Tex Easy Care and the OR "Infinite Guarantee" are sewn into the left side seam near the bottom with an OR logo tag, size tag and "Made in China" tag at the back on the neck seam. A corded "hang" loop is attached to the OR logo tag. All tags are in printed in both English and French. 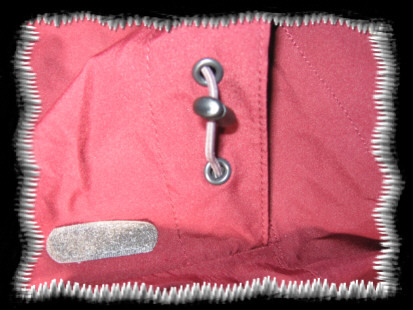 There are two generously-sized side seam pockets with 8" (20 cm) zippers. The almost 9" x 6" (23 cm x 15 cm) pockets are backed with a soft mesh-like fabric. The 25.5" (65 cm) front dual-pull zipper, like the pocket zippers, is covered with a stormflap. The front zipper boasts the flap both externally and internally. 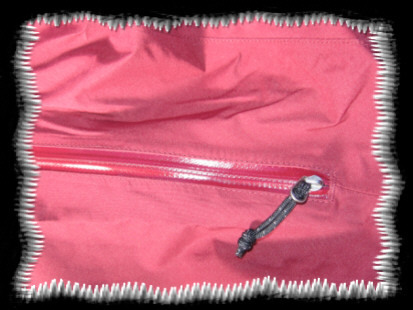 All zippers have 1" ((3 cm) fabric corded zipper pulls. 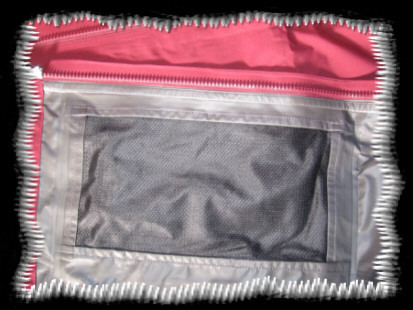 Eighteen inch (46 cm) pit zips are water-resistance and open fully for venting - there is no mesh insert. These zippers also have the above described zipper pulls. The raglan sleeves have elastic cuffs with hook and loop straps to custom fit the wrist openings. On the upper left sleeve is a tasteful small OR embroidered logo and at the cuff of the same sleeve is "Gore-Tex Paclite Shell" in the same grayish color. An attached hood can be rolled and tucked under the stand-up collar of the OR W's Luna Jacket. The collar is 2.5" (6.4 cm) high and quite close fitting. There is a strip of soft fleece-like material on the top interior of the zipper's interior stormflap to prevent chafing when the jacket is totally zippered. There are three hook and loop strips to secure the hood in the collar once the hood is rolled up and tucked under the collar. A nice feature of the hood is a slightly stiffened wide top hem that forms a brim rather than the typical "floppy" hood. The hood can be adjusted and fitted close to the head via two stretchy cords situated on both sides near the body of the Luna. These cords when pulled, cinch the hood. The adjustable cords are threaded through a "channel" on the interior of the hood. Barrel locks keep the cords in the desired positions. The same cord/barrel lock system is used at the hem of the Luna to tighten-up the bottom of the jacket. Thanks to an easy-to-read sizing chart on the Outdoor Research website, my requested size medium Luna Jacket fits me just the way I like my shells to fit. The medium jacket is close fitting enough, yet loose enough, to be comfortable with or without my usual light fleece Patagonia El Cap jacket and two base layers. My measurements are just slightly smaller than OR's medium - Bust: 37" (89 cm), Waist: 27" (69 cm). The sleeves, loosely held, almost cover my hands right to my fingertips. However, they comfortably crumple up to fall at my wrist and the partly elastic wrist hems along with the hook and loop adjustable straps, keep the jacket's sleeves snug and stationary. My sleeve inseam is about 16" (41 cm). The high stand up collar hugs my 13" (33 cm) neck enough to keep out the cold, but doesn't choke me. The collar just barely grazes the underside of my chin and with the hood down still protects the back of my neck higher than the ends of my short hair. The attached hood is adequately sized to accommodate all of my winter hats with the slightly stiffer "brim" portion of the hood protruding enough to shade my sunglasses. When the dual (one on either side of the hood) elasticized drawcords are tightened and secured with their small barrel locks, the hood scrunches down to frame my face. The drawcord fabric channel pulls away from the hood a bit to conform to my face but the outer brim retains its shape so as to continue to protect my face from the elements. The two side seam front pockets are large and positioned perfectly for me to access them with my arms held in a natural-feeling position. The mesh interior fabric feels very smooth to my skin. All of the Luna's zippers - pit zips, pocket zippers and front zippers - move evenly without snagging right out of the box and I found no loose threads, seams or other imperfections. After playing around with the various closures and adjustments, I decided to take a quick one-hour hike with my husband, John, into the BLM land behind our property to just check out the OR W's Luna Jacket. Underneath the jacket, I wore a non-technical polyester pullover and my Patagonia W's El Cap jacket. I also started out with a fleece hat and gloves but quickly abandoned them. I did not utilize the Luna's hood. It was in the low 30s F (-1+ C) with a light wind, gusting around 15 mph (24 km/h) and the sun was shining brightly. The terrain where we headed goes from a brushy, cactus-dotted valley up into the mountains via loose dirt to small-stone-covered hills. There are no trails, we just wandered ever upward. On this trip, we also had to contend with a mixture of 3 to 4" (8-10 cm) of snow in the shaded areas and thick gooey mud in other areas where the snow had melted but the ground hadn't yet dried out. Well, not surprisingly, my planned hour break turned into 3 and I went from wearing the Luna fully zippered to unzippered pits to unzippered front and then into reverse. When hiking up hill in full sunlight, I quickly started to heat up and needed to do some venting. But once we were standing still admiring the view and taking photographs, I started to chill in the slightest breeze. The jacket quickly worked to regulate my body temperature via its zippers during this initial trial run. For the next 4 months, I will be sure to test Outdoor Research W's Luna Jacket thoroughly for comfort, function and durability. The Luna will be my only choice of shell/jacket for the testing period unless weather dictates otherwise. I will wear it with various under/over garments to see what works best for me, but I WILL wear it a lot in all kinds of weather conditions. I do a lot of outdoor activities besides backpacking and I will wear the Luna while sledding, walking, and snowshoeing as well, to additionally test its durability. Hiking will take place in terrain that will include the alpine forests of Colorado in the Rocky Mountain National Park, the high desert areas in the Cooper Mountain range, and the Sangre de Cristo mountain range including the Great Sand Dunes National Park and Preserve. Elevation will range from 5000' up to 14000' (1524 m to 4268 m) and temperatures over the rest of winter and early spring will vary from 0 F to 75 F (-18 C to 24 C). I'm sure to experience mild to very cold, wind and rain and lots of snow in Rocky Mountain National Park and the Sangre de Cristos, especially on snowshoe hikes. The Outdoor Research W's Luna Jacket appears to be well designed and constructed. It is a good looking jacket that doesn't appear to have sacrificed function for style. Right out of the box, it fits me just the way I like it. I'm excited and anxious to "get out there" and put it through its paces. My Field Report is posted below with the results of the first two months' of testing. During this field testing period, most of my hiking took place in south central Colorado. 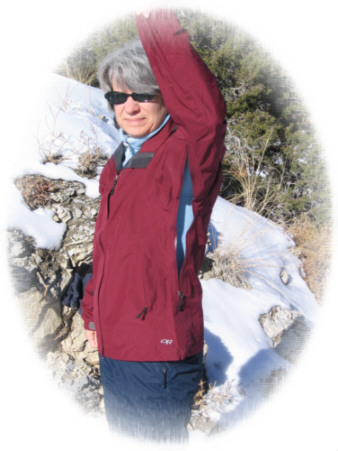 All treks were weekend jaunts into the approximately 100,000 acres (40,468 hectares) of BLM land encompassing the Cooper Mountain range/Royal Gorge area near Canon City or the Wet Mountains south of the Arkansas River Valley. Day hikes were in durations ranging from 2 to 6 hours. The Cooper Mountain range is mostly pinon pine and juniper-covered high desert with rough primitive game and mining trails (for the most part) and is easily accessed just outside of my property fence line. So this was (and will be) most often chosen for my weekenders. My husband and I generally pack up, grab the GPS, pick a trail and go without any planned destination in mind. The Wet Mountains rise up from the Arkansas River Valley and are dense ponderosa pine and sage forests. One of my favorite trails there is the Barlett Trail in the southern part of the Wet Mountains. Elevations I tested in ranged from 5000' up to 14000' (1524 m to 4268 m) and temperatures these past two months varied from 65 F to 40 F (18 C to 4 C) with lots of winds. For the three weeks I was in Michigan, I wore the Luna Jacket 2 or 3 days weekly while walking my dog on asphalt streets (2 M/3.2 km), and on 2 or 3 training hikes (a week) on trails in Pontiac Lake Recreation Area (4 to 6 M/6.4 km to 9.6 km). During my testing, temperatures ranged from 25 F to 59 F (-4 C to 15 C). I hiked in cold, rainy, even snowy conditions on several occasions. In Michigan, I pretty much wore the Luna Jacket in non-punishing situations; groomed trails, and at worst, snowshoeing on groomed trails. These hikes were generally flat with moderate hills and featured no boulders, loose rock or other hazards. Additionally, in Canon City, Colorado where the winter was pretty mild, I wore the Luna around town casually, almost every time I walked out my door! So, while I didn't have any backpacking trips (overnights) during these past two months, the OR Luna Jacket saw plenty of usage, easily totaling 100+ hours. While testing, I've worn the OR Luna Jacket in all kinds of weather with a variety of layers beneath it. 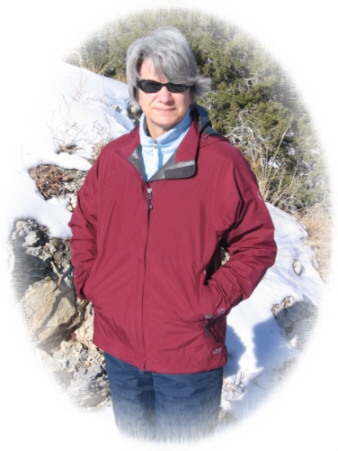 In hiking situations, most often, I wore a long sleeve Patagonia base layer and my Patagonia El Cap Jacket (fleece). As the weather has warmed up, I have been leaving the El Cap stashed in my backpack. For casual wear around town, I usually just toss the Luna on over whatever blouse or shirt I have on. Wearing the Luna in less than ideal weather conditions really demonstrates the quality of the materials of this jacket. Most of the precipitation I have experienced so far has been snow showers in Michigan and some misty rain/snow mix in Colorado. On two different occasions, I was snowshoeing in wet snow falls. The Luna was covered with snow by the end of my hike, but I did not get the slightest bit damp from the outside. I did get a bit of "glow" from exertion though. Even with the pit zips fully opened, my activity level rendered them inadequate. The adjustable hook and loop wrist straps pulled tight against my gloves kept the snow from touching my skin when I took a tumble and the hood protected my hat from wetting out. Using a hood is a new thing for me. I've never been a fan of hoods, mainly because the cons outweigh the pros for me. I only wear a hood when copious precipitation (or testing) requires me to wear one. So, it is important to me how well the hood can be stored as much as how well it works to keep me dry! I couldn't accomplish stashing the hood by myself while I was wearing the jacket, but my son easily tucked it in on the trail in no time at all. It neatly folds under the collar when not being worn and is almost totally invisible. A quick tug at the hook and loop closures and I can retrieve the hood and pull it up quickly while on the move. When not cinched tightly about my face, the hood really restricts my peripheral vision. Since I already have poor peripheral vision, this is not a plus for me. However, the same feature is great for shielding my glasses and keeping them spot-free. With the gusty winds I frequently encounter, cinching the hood is almost mandatory anyway. If I don't, I won't be wearing the hood for very long. Tightening is accomplished by pulling on the elastic cord on either side of my face and using the barrel lock closures to hold their position. I can do this with one hand, but it's a lot faster using both hands. As to our Colorado winds, the OR Luna Jacket stands up to them grandly! Even when there is no call of rain or snow, I have worn this jacket just to foil the wind. No gusts that I've encountered so far have been able to penetrate the fabric yet. My legs have had goose bumps the size of golf balls from the wind and my core has remained snug. The Luna is great for wind protection. So far, one of my concerns has been the lack of breath-ability. I sweat with very little effort and even in the winter months I have used the pit zips and exercised the front zipper a lot. I find this usually works, but on a couple of occasions, I had to remove layers to aid in heat release. I will be anxiously testing how the warmer weather affects the functionality of the Luna. Which brings me to the zippers. I have not yet mastered zipping up the front zipper with just one try yet. This is something I thought I had down when I was in first grade, but the Luna's two-way zipper just causes me fits. I can't seem to line it up properly. The pit zips works smoothly and while I can't open and close them one-handed, I have had no problems with them. I grabbed the cuff of the sleeve I'm going to be venting with the same hand and used my other hand to open/close the zipper. Very nice! I have been very pleased with the lack of visible wear after these two months of testing. I have not snagged or ripped the mesh lined pockets, nor broken a zipper nor inflicted any other damage. I did get the sleeve of the jacket dirty but with just a wet washcloth, was able to wipe it clean. So far, so good! Bring on the Spring rains! My Long Term Report is posted below with the final results of my testing. Unfortunately, since my last Field Report there has been absolutely no rain, not even a sprinkle or a faint mist. The various raging brush fires in our area testify to exactly how dry Fremont/El Paso counties (Colorado) have been. So, my Outdoor Research Luna Jacket's waterproofing hasn't had much of a workout these last two months. However, I have worn the Luna at least two or three times each week anyway, both around town and on the trail. Most, heck, ALL, of my trail time during my long-term testing has been in the BLM lands controlled by the Royal Gorge regional offices. This land is very rugged with little or no real trails. The terrain is varied from dust to sand to gravelly, and then there are the medium to large rocks and huge boulders. We pretty much just pick a ridge we would like to end up on and bushwhack our way to it. Sometimes we make it, other times we get sidetracked or we reach an impasse. Either way, we usually start at 5600+ feet (1707 km) and go up to 7000+ feet (2134 km). Since I can't further comment on the waterproof capabilities beyond my Field Report, I will focus on other benefits of the Luna jacket. First, these last two months, I have worn the Luna on every occasion where anything more than a base layer shirt was required - at least 24 wearings by my account. The fit is such that I can fit two or three layers under the jacket. However, lately, I've mostly worn it over just a t-shirt at night around town and when hiking up high on the mountains around my home. Even with the pit zips fully opened, the Luna now causes me to be uncomfortably warm. Anything over 50 F (10 C) and the Luna became a sauna for me when I was exerting myself in any way. The Luna continued to shine as a wind jacket and that was a real plus for me. I was often buffeted by high winds especially above the tree line and even after a very warm climb, I became chilled. The OR jacket really blocked the chill and enabled me to enjoy the views while resting. I continued to have trouble with the front zipper. It was a rare occasion when I would be able to zip the jacket up on the first try. Usually, it would take two or three tries to get the dual ends to line up and cooperate. I often got very frustrated with the zipper. I am not sure if it was some sort of a design flaw or just me. I do, however, have several other jackets with the same sort of zipper and haven't experienced this problem before. The Luna is very versatile in the manner it allows adjustments to fit. The stretchy drawcords with their barrel locks tailor the hem of the jacket nicely to my hips for as snug a fit as I need depending on the weather. While the jacket is slim enough to not really need to be tightly cinched, on at least one hike in the Wet Mountains, I did pull the hem snug to keep out the mosquitoes. On that same hike, I overcame my aversion to hoods and pulled the hood's drawcords just as tight for the same reason. It worked well! I found the pockets on the Luna to be very roomy holding my digital camera on several in-town trips and even bottled water on more than a few walks. The pockets are plenty large enough for me to walk with my hands comfortably in my pockets even when I have items such as my cell phone in there too. Because I wore this jacket more than I think the average person would wear it in four months, I'm very impressed with the durability of the Luna. There isn't a snag, a pulled thread, a tear or worn, shiny spot to be seen. I constantly heard the scraping sounds of dried cedar trees dragging around my jacket when backpacking and never a mark to be found. There aren't any signs of wear from the rubbing of my backpack shoulder straps, either. Nor are the mesh pockets snagged or pulled loose. The drawcords show no signs of being stretched out and the hook and loop wrist straps still "hook and loop". My kudos to Outdoor Research for the great quality! The Outdoor Research Luna Jacket has definitely earned a permanent place in my gear closet. With its superior design and craftsmanship, I'm sure to enjoy many more miles/kilometers of trail and casual use. Here in southern Colorado, we are just going into the time of year where afternoon thunderstorms are almost a daily weather prediction for the mountains surrounding my home. It is pretty much a "given" the Luna will be a staple item in my pack! Thank you to BackpackGearTest.org and Outdoor Research for introducing me to a truly great jacket!